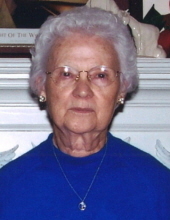 Louise Mitchell, 93, of Paducah, Kentucky, passed away at 2:45 a.m. on Friday, March 29, 2019 at her residence. Louise was born at home in Palma, Kentucky on January 12, 1926 to the late Marcus Barnett and Stella English Fiser. She enjoyed working in the yard and caring for her flowers. She was an active member of Northside Methodist and recently became a member of Broadway United Methodist Church. She is survived by her son, David Mitchell of Paducah, Kentucky. She was preceded in death by her parents; her husband of over 60 years, Lacy Mitchell; one son, Kevin Mitchell; and two sisters, Lillian Lampley and Rita Walker. A funeral service will be held at 1:00 p.m. on Monday, April 1, 2019 at Milner & Orr Funeral Home of Paducah with Rev. Joe Beal officiating. Burial will follow at Woodlawn Memorial Gardens. Visitation will begin at 11:00 a.m. until time of service on Monday, April 1, 2019 at the funeral home. Expressions of sympathy may take the form of contributions to: Easter Seal Center, 801 North 29th Street, Paducah, KY 42001.